Our Fab Fash Life: Almost 1 with Milk-bone! This blog post is sponsored, but all experiences and opinions are 100% mine and mine alone. Enjoy and please feel free to comment on what you think. I'm a "BIG GIRL" Now! I can’t believe that Piper is almost 1 year old, it’s just amazing to think we have only had her for a matter of months compared to the feeling like we have had her for years. I have been thinking up ideas for a birthday party to celebrate our amazing and short time together so far, plus it's National Pet Month and you know I have to spoil my baby girl! I got the idea to throw here a little party to celebrate it together just her and I, that way I can spoil her all by myself….lol!! I only buy her the best when it comes to treats, as you guys know I’m super picky about what I feed her. It has to be something she loves that I feel good about feeding her. 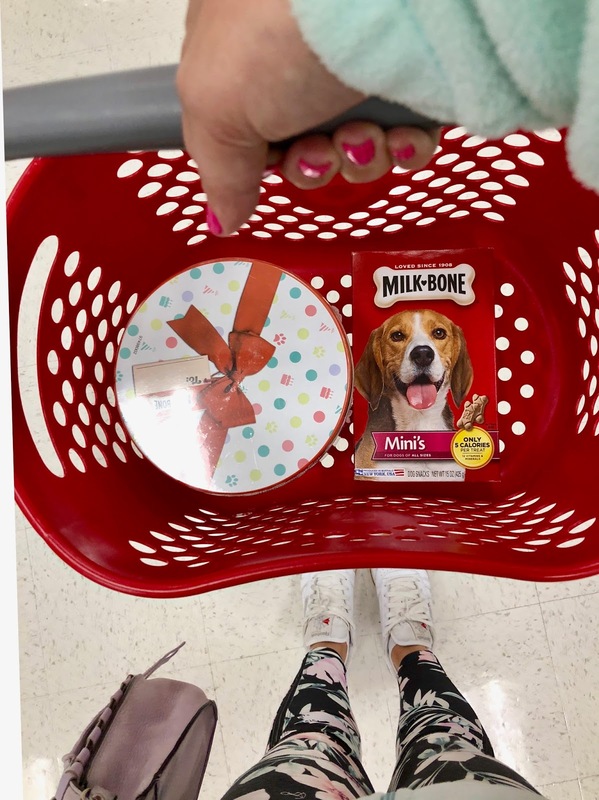 That’s why we love to get her Milk-Bone® dog treats from Target, it's a brand name that has been in my household since Iwas a kid. We always love going to Target - it’s our one stop shop for Piper’s pets supplies, and just about anything else you can think of. The Target staff is always super helpful, I couldn’t find the item I was looking for, so an employee named Pamela glady went into the back to find it for me. While I was eating for her Ilooked over the shelf of Milk-Bone products, do you know how big their selection is? I had no idea, they have a little bit of everything, in all sizes for all dogs in all flavors. It’s amazing how much care they put into making sure our dogs are happy and healthy. In my search to spoil Piper I saw the coolest item, it’s called the Milk-Bone® Happy Birthday Canister. Boy oh boy is it an enormous treat for your dog, I now Piper absolutely loves it. It includes an assortment of 5 yummy flavors such as bacon, beef, chicken, sausage, and turkey flavors. I think bacon is Piper’s favorite, because it seems to be the one she goes for most…. granted it’s not the only one…lol! They’re wholesome treats that come from the heart, and they’re Made in the USA. Did you know that Milk-Bone dog treats help clean teeth and freshen breath? They also include 12 vitamins and minerals. Me either! Until I did a little research on their website. I just love the tin container because everything stays fresh, and it also keeps the crumbs from escaping all over my pantry shelves. To put together the entire adorable birthday theme I got some gold balloons, one was a number 1 because Piper will be 1 of course. Then I grabbed some matching plates and the tiniest little birthday hat you’ve ever seen, I’m super surprised she didn’t go crazy to try and get it off. She’s not that great with wearing stuff on her head, but I have to say she’s getting much much better. I remember Nunah would let me put anything on her, and she would just let me pose her. She just didn't care as long as she was pleasing Mama. What an angel, I definitely miss the heck out of her. The one good thing is if Piper knows I have a cookie for her she’ll do whatever I ask, so as you can imagine quite a few Milk-Bones were eaten during the production of this shoot. To create the perfect little set I took her favorite spot on my faux fur blanket where she just loves to snooze, and stacked the gold balloons, then I stood the #1 upright. My husband and I just giggled, she sat there all adorable with her teeny tiny birthday hat on one ear. She does a deep head tilt whenever I say the word cookie, that’s what we call dog treats in our house. There are a couple words that get a head tilt out of Piper, words like walkies, bye-byes, cookie, go for a ride, and let me tell you it’s the cutest little thing in the world. No matter where we go there’s always someone that approaches us to say hello, as they start to talk she gives this super inquisitive look ,and just tilts her head back and forth. She always makes it seem like she’s paying attention with 110% of her brain power, I’ll have to share the video with you guys on Instagram, you are going to love it. There are so many things about Piper that I love, she makes me smile all day. One of the ways I show her my appreciation and love for all the happiness she brings me, is to get her the treats she truly loves. 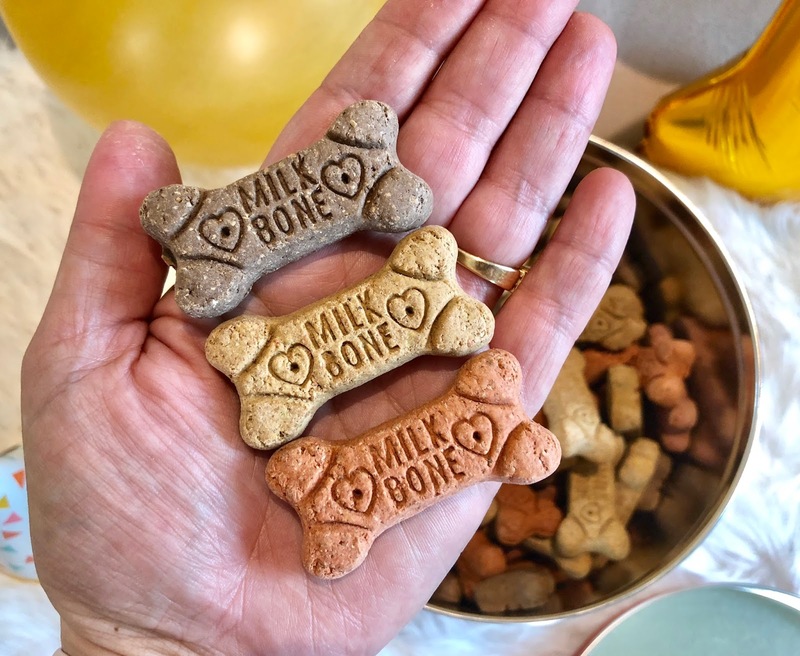 Milk-Bone® Mini Dog treats and the fun and festive Milk-Bone®Happy Birthday Canister. 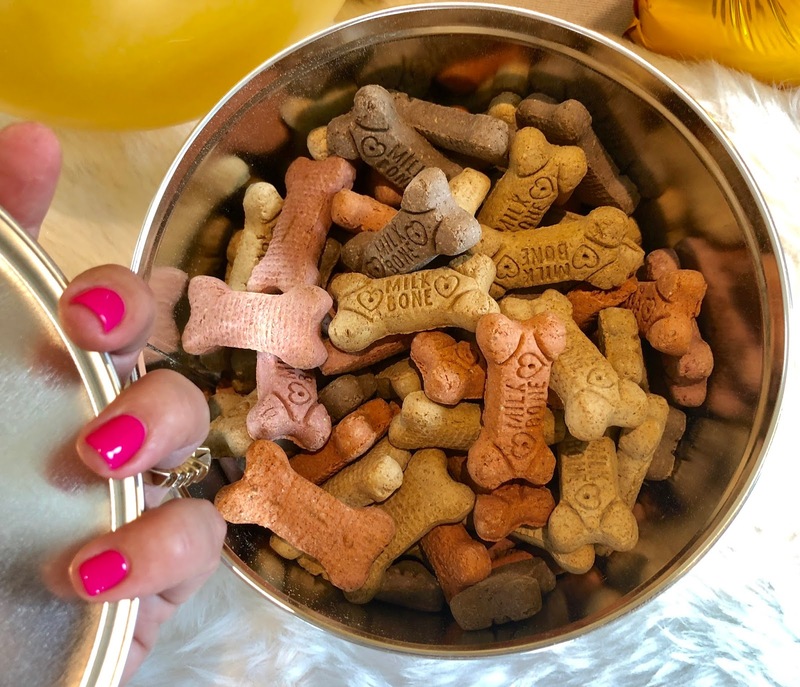 The Minis are only 5 calories per bone, so that means you can treat your little cutie more, and there are over 200 treats per box. Yeah as you can see she is pretty smitten with her Milk-Bone dog treats, and as long as she loves them I'll keep buying them. Do you buy Milk-Bones for your pup? If not you should, you definitely can't go wrong with them, it’s a brand we trust and recommend 100%. Give them a go, your dog will love you for it, and so will his or her tummy. Then again so will your wallet because the price point is perfection, not to mention the savings you get when you pick them up at Target. Plus check out these awesome Cartwheel deals! My dog loves these treats. Happy Birthday Piper, you are so darn cute! Ahhhh Thanks so much Debra!! OMGoodness yes Milkbone is the best, I've been buying them as long as I can remember! Oh my goodness! Your pup is so stinking cute! That little puppy is too cute!! I bet he felt so special on his very special day! Thanks so much......Ahhha she's just a tad spoiled ....lol!!! Happy bday to your dog! What a cute little pupper! Happy birthday! It's so funny. We grew up with dogs, and as a kid I would eat milkbones with my dogs. Gross, huh? What a cute idea! My dog would love this! Your dog is gorgeous! Happy Birthday, Piper! I love your hat. Ahhhh you definitely sound like you need a minpin puppy....!!!! Awesome pictures! Happy birthday, Piper! Too cute! Thank you Sandy!! I just can't help spoiling her...lol!! My daughter just was "Gifted" her first puppy! Dixie is our new fur baby, she is 3 months old. My Daughter Cassandra just had to get us to purchase Milk Bone Treats! They are the miniatures, so cute and tiny, just like her. P.S. Love the Leggings! 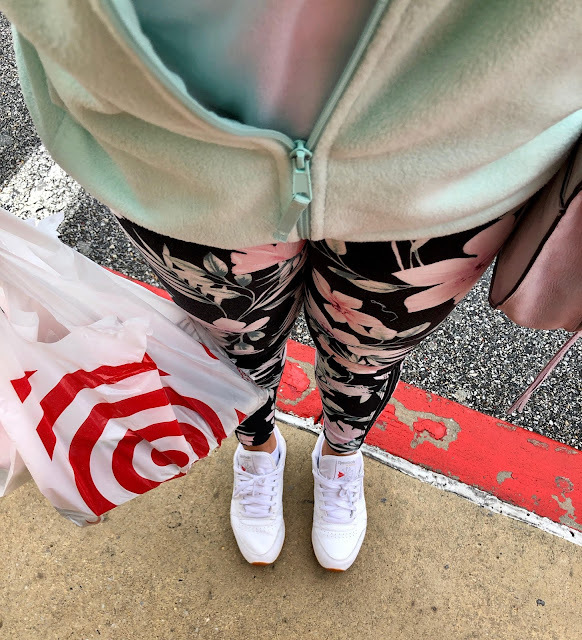 I am Legging Distributor and I live and breath in Capri's and Leggings! Awhh there's nothing is more amazing that a puppy i the house, know you're loving every minute of it!! Same here about the leggings, they're so comfy and cute!!! The Milk Bone minis remind me of animal crackers. What a great idea! Ha Ha that's so funny because I agree with you!! What breed of 🐕 is he or she? Happy Birthday Piper! What a cute lil dog. Awww cute. Love those legging too! OMG, that is so cute! The luckiest dog in the world, lol. Thanks for posting! I really like that the Minis are only 5 calories per bone as my dogs need to stay on a diet. We’ve given our furry friends Milk-Bone Treats and vitamins for years! Every dog we’ve ever had love the Milk-Bone products. So like you, we’ve stuck with a product that works and pleased our furry friends! Thank you for sharing! Amen to that, especially when you know they love them!! Ohhh 70lbs, what kind/breed of fur baby do you have? So cute! My dog goes crazy for Milkbones. She's a little ham...lol!, Isn't it crazy how they absolutely love them!! Aww, love spending time with my grand puppy too! Ahhhh they are so much fun aren't they??? That is adorable,I want to have a puppy party! Aww thank you...... you should definitely get a new puppy then!! They're the best friends ever!! Aren't dogs amazing? I love the Happy Birthday container...perfect! I just love dog celebrations! Good day!! First post I came upon today, entering from a Sweepstakes link and the picture of the dog got me smiling. Nice way to start my day with coffee in hand. What an adorable doggy party! I bet he had the best Birthday ever! :) Thanks for sharing! Great idea!! I may have to replicate this party for my cats, though they won't care... They are cats! I grew up with labs! I used to love watching them eat milkbones! Milk bones do a dog good! Happy Birthday, Piper. I hope you enjoyed your party. Happy birthday little Piper!! Wishing you many more. Wishing my cats were dogs today! They are so finicky! Piper looks so excited for birthday goodies. It is nice that there are 5 different flavors. I think my dogs would like the bacon ones the most too! Piper is looking very royal in her birthday hat! Piper, you’re not getting older, your gaining more experience. Piper is such a great doggie model! I love seeing all your pictures with Piper. She is such a great little dog who takes a great picture. Happy Birthday, Piper! You are looking very haute on your fur throw. So fun! Love the photos with Piper! Some people laugh at us when we talk about our furbabies but we know they are family. Love you had a party and found the milk bone can. My niece has one just like yours and his name is PRINCE. And he was the ruler till my great niece came along. Now prince is in second place and he thinks zadaya is his to watch and guard. Piper is adorable in her birthday hat! I love seeing pictures of you and Piper. It is so cute that you dressed Piper in her birthday hat! So cool. I like this picture. SO cute! My furbaby Gizmo absolutely loves Milkbone!! We buy our dogs Milkbone all the time through Chewey.com. They never run out. Piper is so precious - and what a cute name, too! My cat loves dog cookies, so I may get him some of the teeny Milk Bones!